Home Archive for category "States and Statehood"
How have international organizations been able to expand their governance powers so significantly over the past century? What has been the role of international law in making this extraordinary expansion of powers seem possible and legitimate? And what does this tell us about international law itself? 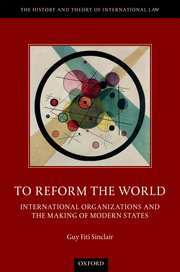 My book, To Reform the World: International Organizations and the Making of Modern States (Oxford University Press, 2017), explores these questions by examining the expansion of legal powers exercised by international organizations through informal processes of discourse, practice, and (re)interpretation (‘IO expansion’ for short), rather than by the formal amendment of an organization’s constituent instrument. The book argues that IO expansion has been imagined, understood, and carried out as necessary to a process of making and remaking modern states, based on a broadly Western model. It also argues that international law plays a central, protean role in that process. It would be overly simplistic, therefore, to contend that IO expansion has resulted only in a loss of sovereignty by states. To the contrary, my argument is that IO expansion is intimately bound up with the creation of states, the construction of state powers, and the very constitution of modern statehood. The book develops these arguments through detailed accounts of three episodes of IO expansion. The first involves the beginnings of technical assistance in the International Labour Organization (ILO) in the interwar period. The second concerns the emergence of United Nations (UN) peacekeeping in the two decades following World War II. And the third encompasses the World Bank’s ‘turn to governance’, which reached a high point in the 1990s. By examining three very different international organizations, spanning different periods in the 20th century, the book is able to identify broad themes in how international law has evolved and works in the world. The blog is happy to announce that over the next week, we will host a discussion of Guy Fiti Sinclair’s book, To Reform the World: International Organizations and the Making of Modern States. Guy Fiti Sinclair is a Senior Lecturer at Victoria University of Wellington Law School. His principal area of research and teaching is public international law, with a focus on international organisations law, the history and theory of international law, and international economic law. Guy will open the discussion this morning with an introduction to the text. This will be followed by posts from Jan Klabbers, Megan Donaldson, Devika Hovell and Edouard Fromageau. Guy will close the symposium with a reply to the discussants. Early this month, 5,600 US soldiers were deployed to the southern border as a response to an approaching migrant caravan consisting of several thousand Central Americans. U.S. President Donald Trump called the advancing group in official statements a foreign “invasion” that warrants deploying up to 15,000 army members to support the border patrol. He further publicly warned that “nobody is coming in” and once more clarified his stance on migration stating that “immigration is a very, very big and very dangerous, a really dangerous topic”. The latest footage of U.S. officers firing tear gas at migrants of the caravan-including at children- that tried to enter the country, is the disturbing result of Trump’s sketched horror scenario of a violent invasion of Central Americans. This strict stance on migration is just the most recent example, the tip of an iceberg of the Trump administration’s aim to establish, step by step, a migration policy that erodes national and international standards of protection. The comprehensive new migration strategy seemingly builds on a set of immediate, as well as long-term measures aiming at those who attempt to enter the United States as well as at those who are already within the state’s territory. For example, last month a new immigration policy was introduced that aimed at restricting immigrants from using public benefits, or else they may be illegible for permanent residency later on. This is just one of numerous examples of how the Trump administration severely restricted or just completely abandoned given standards such as the abolishment of the Deferred Action for Childhood Arrivals program, the prevention of dreamers from living and working in the U.S.A., as well as the abrogation of the temporary protective status programs. These turnovers of existing standards affected more than two million regularly residing migrants in the U.S.A. and fostered sentiments of fear, nationalism and division.